Cool! 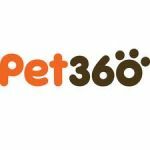 Save an average of 20% on Pet360 with 40 Coupon Codes, and 10 Deals! Pet360 is dedicated to making pet parenting easier by conveniently putting all the information and products you need to succeed in one place. Details: $5 off of your order and they will donate $5 to The Grey Muzzle Organization! The $5 contribution will not be reflected at checkout, however, notifications will be sent via e-mail after all donations have been provided to The Grey Muzzle Organization. Expires on 11/30/2013. Details: Get $6 off Hi - or dog & cat food. Expires on 03/31/2014. Details: Free Shipping On Orders of $49 or More. Details: Enter your email address and save 5% on your first purchase. Details: Enter Your E-mail to Receive 5% Off Your First Order. Details: Get $8 off Triumph dog and cat food. Expires on 03/31/2014. Details: 15% Off and Free shipping on orders of $59+. Some exclusions apply. Expires on 02/28/2014. Details: Get 30% off ALL Vet Diets + Free Shipping on orders $49+. Expires on 02/20/2014. Details: New Customers - 15% Off + Free shipping on $59+. Limited time offer. Details: 5% off your first order with email sign up. Limited time offer. Some restrictions apply. Details: Get $25 Off your Food Order of $100 or more for New Customers. Exclusions Apply. Expires on 02/06/2014. Details: Get $8 off Nutrisource dry dog food. Expires on 03/31/2014. Details: Get $10 off Wellness cat and dog food. Expires on 03/31/2014. Details: Take $12 off Natural Balance. Expires on 12/31/2013. Details: Get Up to 30% Off Top Vet Diet Items including Purina Vet, Iams Vet, Hills RX, and Royal Canin Vet Diets. Expires on 02/15/2014. Details: Get up to 74% off New Economy Dog Crates. Expires on 04/01/2014. Details: Get up To 30% off all Flea & Tick products. Expires on 04/01/2014. Details: Get up to 35% off cleaning supplies. Expires on 04/01/2014.